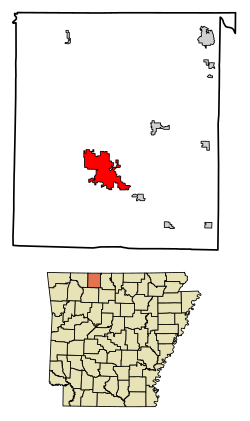 Location of Harrison in Boone County, Arkansas. Buffalo National River, Harrison, Arkansas was the first National River to be designated in the United States. Harrison is a city in Boone County, Arkansas, United States. It is the county seat of Boone County. It is named after General Marcus LaRue Harrison, a surveyor that laid out the city along Crooked Creek at Stifler Springs. According to 2017 Census Bureau estimates, the population of the city was 13,079, up from 12,943 at the 2010 census and it is the 30th largest city in Arkansas based on official 2017 estimates from the US Census Bureau. Harrison is the principal city of the Harrison Micropolitan Statistical Area, which includes all of Boone and Newton counties. Race riots by whites in 1905 and 1909 drove away black residents, establishing Harrison as a sundown town. Today (2019) it is known as a center of white supremacist activity, including the national headquarters of the Knights of the Ku Klux Klan. While in the 2010 census the population of Arkansas was 15.7% African-American, in Harrison it was 0.9% and in Boone County 0.5%. Peace March in Harrison displaying love for diversity in the city. Aerial view of Downtown Harrison. The Courthouse Square located in the National Historic District. Dammed portion of Crooked Creek in Harrison. There is a walking trail around Lake Harrison. Crooked Creek/Lake Harrison used as the site for Crawdad Days. Boone County was organized in 1869, during Reconstruction after the Civil War. Harrison was platted and made the county seat. It is named after Marcus LaRue Harrison, a Union officer who surveyed and platted the town. The town of Harrison was incorporated on March 1, 1876. The notorious bank robber and convicted murderer Henry Starr met his fate in Harrison on February 18, 1921, when Starr and three companions entered the People's State Bank and robbed it of $6,000.00. During the robbery, Starr was shot by the former president of the bank, William J. Myers. Starr was carried to the town jail, where he died the next morning. On May 7, 1961, heavy rain caused Crooked Creek, immediately south of the downtown business district, to flood the town square and much of the southwestern part of the city. Water levels inside buildings reached eight feet (2.5 m). Many small buildings and automobiles were swept away. According to the American Red Cross, four lives were lost, 80 percent of the town's business district was destroyed, and over 300 buildings were damaged or destroyed in losses exceeding $5.4 million. Harrison is just north of the Buffalo National River. On March 1, 1972, 100 years after the establishment of the first National Park at Yellowstone National Park, President Richard Nixon signed into law the Buffalo National River as the first National River in the United States. The project was spearheaded by longtime congressman John Paul Hammerschmidt of Harrison, Arkansas. In 1982, Kingdom Identity Ministries, an anti-gay Christian Identity outreach ministry identified as a hate group by the Southern Poverty Law Center, was founded in Harrison. In 2014, a peace march and vigil celebrating the life and legacy of Martin Luther King Jr. was held in downtown Harrison. The march was hosted by the Arkansas Martin Luther King Jr. Commission. U.S. Routes 62, 65, and 412 pass through Harrison. U.S. 65 leads north 33 miles (53 km) to Branson, Missouri, and south 108 miles (174 km) to Conway, Arkansas. U.S. 62 leads west 43 miles (69 km) to Eureka Springs and beyond to Rogers and Bentonville. U.S. 412 leads west 73 miles (117 km) to Springdale. U.S. 62 and 412 combined lead east 48 miles (77 km) to Mountain Home. The Boone County Courthouse, built in 1909, and the Boone County Jail, built in 1914, were both designed by architect Charles L. Thompson and are listed on the U.S. National Register of Historic Places. Harrison is home to the general office of FedEx Freight, a leading Less-Than-Load (LTL) freight carrier. Arkansas Freightways, later renamed to American Freightways, was combined with Viking Freight to become FedEx Freight in February 2001. Walmart store #2 opened in 1965. Claridge Products and Equipment, Inc., is one of the largest Visual Display Board manufacturers in the world. It has been in business for over 60 years. It is a family-owned business and has been certified as a business owned and controlled by a woman from the National Women Business Owners Corporation (NWBOC). The National Trust for Historic Preservation has recognized the Harrison Courthouse Square Historic District. It contains a large number of the city's original commercial and governmental structures, including the still-used courthouse in the center of the square, the recently refurbished Lyric Theater, and the 1929 Hotel Seville, which underwent a complete restoration in 2008. Located just south of Harrison off Scenic Highway 7, Fenton's Berry Farm provides the area with locally grown fruits and vegetables in season. In 2008 F.S. Garrison Stadium was opened after almost six years of fundraising by Kim Rosson, President,[who?] and the Goblin Booster Club. It is named in memory of F. Sheridan Garrison, founder of the American Freightways Corp. (now FedEx Freight). Over $7 million was raised for the stadium project by the Goblin Booster Club. The largest donors were the Garrison Family and Mosco Cash, owner of Home Ice Company. Before the first game against the Mountain Home Bombers on September 12, 2008, it was donated to the Harrison School District. 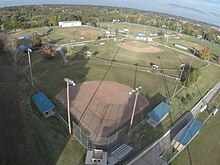 Located in Harrison, Arkansas the Equity Bank Sports Complex features state of the art baseball/softball fields. Residents are served by the Harrison School District. The Harrison High School mascot is the Golden Goblin. Harrison is also home to North Arkansas College (Northark). The Harrison School District had been a member of the North Central Association of Colleges and Schools since 1936 until its dissolution in 2014. It is now a member of the AdvancED commission. Harrison has two stations of its own, including KTKO-LP and K26GS-D (both in Harrison proper). Harrison KTKO-TV 8.1, also known as TKO 8, provides coverage for local events including Goblin Sports, Harrison City Council meetings, and Boone County Quorum Court meetings. It is an affiliate of the Me-TV Network showing a wide range of classic television programming. K26GS is a This TV affiliate and also provides local programming to Harrison. KWBM, a Daystar affiliate, is also licensed to Harrison, however its offices are in Springfield, while its transmitter is located in Taney County, Missouri. KWBM leases part of its signal to Springfield Fox affiliate KRBK, in order to relay reliable Fox TV coverage to Harrison and the southern portions of the Springfield TV market. Harrison is part of the Springfield, Missouri, television market, and receives stations from Springfield, including: KYTV (NBC), KOLR (CBS), KSPR (ABC), KOZL (MyNetworkTV), and KRBK (Fox). It was also featured in a BBC TV show in the UK named Miriam's Big American Adventure, hosted by Miriam Margolyes. Harrison is served by Boone County Regional Airport. Scheduled flights from Harrison to Memphis, Tennessee, and Dallas/Fort Worth, Texas, are offered by Southern Airways Express. Brandon Burlsworth, All-American offensive lineman, played for the Arkansas Razorbacks in the late 1990s; Drafted by the Indianapolis Colts in the third round of the 1999 NFL Draft, but was killed in a car accident eleven days later; born in Harrison; 1994 graduate of Harrison High School. ^ "City of Harrison Arkansas". City of Harrison Arkansas. Retrieved September 12, 2012. ^ "Quick Facts - City of Harrison, Arkansas". Retrieved 5 August 2013. ^ a b "Geographic Identifiers: 2010 Demographic Profile Data (G001): Harrison city, Arkansas". U.S. Census Bureau, American Factfinder. Retrieved September 25, 2013. ^ "Harrison Race Riots - Encyclopedia of Arkansas". encyclopediaofarkansas.net. Retrieved 2018-02-20. ^ Loewen, James W. (2005). Sundown Towns : a hidden dimension of American racism. The New Press. p. 36–37. ISBN 156584887X. ^ "The KKK Embraces Diversity in Harrison, Arkansas". Vice. 2014-03-11. Retrieved 2018-02-20. ^ "Knights of the Ku Klux Klan". Southern Poverty Law Center. Retrieved 2019-02-16. ^ "Native Americans of Carroll County, AR - Arkansas Guide to Eureka Springs, Berryville, Green Forest, and more!". Retrieved 1 May 2017. ^ Hilliard, Robert L.; Michael C. Keith Waves of Rancor M. E. Sharpe 1999 ISBN 978-0-7656-0131-5 p.158 "kingdom+identity+ministries"
^ "Kingdom Identity Ministries". Southern Poverty Law Center. Retrieved 22 August 2017. ^ "Nonviolence Youth Summit Part 10 - Education Alliance". Retrieved 1 May 2017. ^ MrcleanMinistries (5 April 2014). "Mrclean at 2nd Part of Non Violence Youth Summit March Harrison, AR". Retrieved 1 May 2017 – via YouTube. 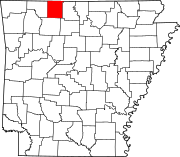 ^ "State & County QuickFacts: Harrison (city), Arkansas". U.S. Census Bureau. Archived from the original on September 20, 2013. Retrieved September 25, 2013. ^ "ARKANSAS - Boone County". Retrieved 31 January 2019. ^ "History - About FedEx". Retrieved 1 June 2016. ^ "About Claridge :: Woman-Owned Business". Claridge. Retrieved 1 June 2016. ^ "Work - Harrison, Arkansas Chamber of Commerce". Retrieved 1 June 2016. 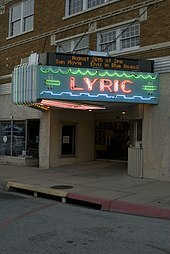 ^ "Ozark Arts Council in Harrison, AR - About the OAC". Archived from the original on 28 September 2013. Retrieved 28 June 2013. ^ "F.S. 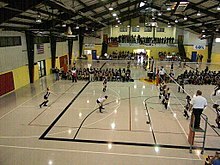 Garrison Stadium - Harrison Arkansas". Retrieved 28 June 2013. ^ "Burlsworth Football Camp ~ A chance to learn from former Razorback stars". Brandon Burlsworth Foundation. Retrieved 28 June 2013. ^ "HarrisonDaily.com". Retrieved 1 May 2017. ^ "Radio Stations in Harrison AR". On The Radio.Net. Retrieved 28 June 2013. ^ "TKO 8 Local Television Serving You". Retrieved 28 June 2013. ^ "Me-TV Network | About Me-TV". Archived from the original on 28 June 2013. Retrieved 28 June 2013. ^ "H. Glenn Mosenthin, "Missouri and North Arkansas Railroad"". encyclopediaofarkansas.net. Retrieved April 28, 2013. ^ Cathy Kunzinger Urwin, Agenda for Reform: Winthrop Rockefeller As Governor of Arkansas, 1967-71, p. 37. Fayetteville, Arkansas: University of Arkansas Press. Retrieved August 19, 2012. ^ "Harrison, Arkansas Köppen Climate Classification (Weatherbase)". Retrieved 1 May 2017. Froelich, Jacqueline; Zimmerman, David (Summer 1999). "Total Eclipse: The Destruction of the African American Community of Harrison, Arkansas, in 1905 and 1909". Arkansas Historical Quarterly. 58. pp. 133–159. Froelich, Jacqueline (2014). "Race, History, and Memory in Harrison, Arkansas: An Ozarks Town Reckons with Its Past". In Kirk, John A. (ed.). Race and Ethnicity in Arkansas: New Perspectives. Fayetteville, Arkansas: University of Arkansas Press. pp. 61–70. doi:10.2307/j.ctt1ffjdtz.9. Rowles, Dustin (January 2, 2015). "Harrison, Arkansas Continues To Be One Of The Most Racist Towns In America". Uproxx. Bowden, Bill (September 19, 2017). "Contentious signs jettisoned in north Arkansas city; one called diversity 'code word for white genocide'". Arkansas Democrat-Gazette. 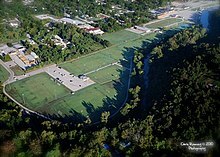 Wikimedia Commons has media related to Harrison, Arkansas. Wikisource has the text of a 1905 New International Encyclopedia article about Harrison, Arkansas.